The following is based on the experience other crabbers have shared over the internet about their Ruggies. Rugosus enjoy a temperature around 85*F degrees Fahrenheit/29.44C. They like their humidity to be in the same range (80-85%). Rugosus have been found to dig around more in substrates that consist of mostly sand. A mixture is fine as long as that mixture has a higher amount of sand in it. It's important to feed your land hermit crabs a wide variety of fresh and organic foods. 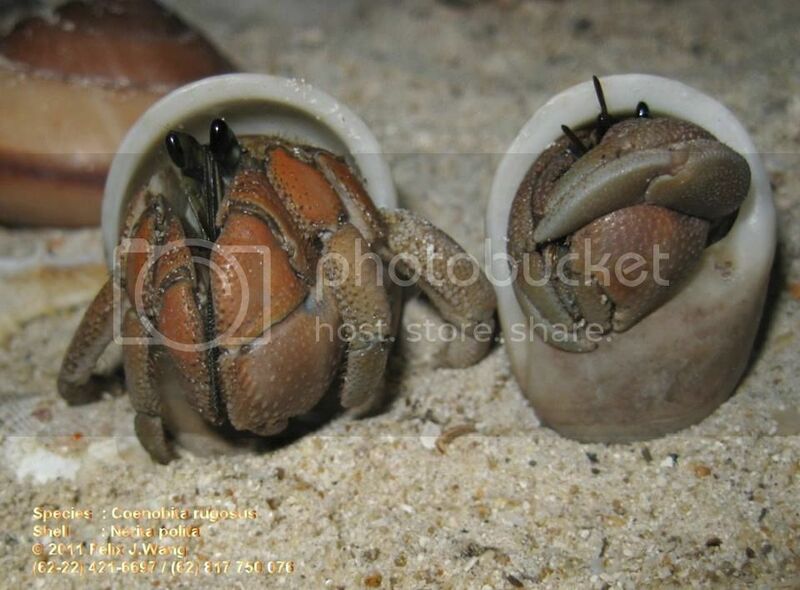 All land hermit crabs need calcium and protein on a daily basis. You can offer these in the following ways: cuttlebone or oyster shell for calcium; srhimp and other meats for protein. These are not the only sources of calcium and protein! Each Rugosus should be able to dip their shell into a pool of dechlorinated fresh water and an ocean grade salt water. Coenobita rugosus are very active if kept in the right conditions. Most people say that their Ruggies are among the most active species they keep. Although in the wild crabs naturally segregate by species about 98% of the time, c. rugosus can be kept with c. clypeatus sometimes. You should never have just one of a species, get Crabby a species-buddy! I'd love some up close and personal pictures from members for this care/ID sheet. If you have any good Ruggie pics, post them here & I'll add some in!